India’s ties with New Zealand can be designed as a template for closer Commonwealth cooperation, writes India Inc. Founder & CEO Manoj Ladwa. India and New Zealand share ties that go back centuries – as former British colonies and as important members of the Commonwealth. But unfortunately, the relationship hasn’t yet achieved the potential that exists for closer cooperation on a range of issues – including strategic, global terror and bilateral trade. New Zealand features prominently in the Indian consciousness – and in Indian news reports – mostly when the two countries meet on the cricket field. I dare say that legendary all-rounder Sir Richard Hadlee is the most famous New Zealander in India. But away from the arc lights, ties between the two countries have been growing steadily, albeit at a slower pace than many of us would like. At a time when Indian students are finding it increasingly difficult to pursue higher studies in the UK and the US, New Zealand has been slowly emerging as an alternative to these traditional powerhouses of education. At the end of 2016, 29,000 Indian students were studying in New Zealand, making India the second-largest source of foreign students to the country. I am hopeful that these students will emerge as great brand ambassadors for the relationship in the years to come. But these are early days. 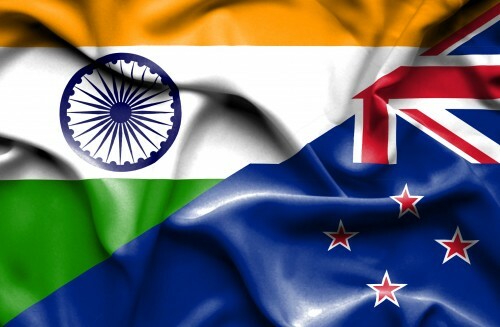 Bilateral services trade between the two countries has more than doubled to $1.36 billion, taking the total trade between India and New Zealand to $2.6 billion. These are admittedly very modest figures, but the good news is that both governments are taking steps to build on this modest base and scale up economic ties closer to their full potential. But with about 52,000 Indian tourists visiting New Zealand last year (and the numbers as rightly growing), the path for much greater empathy between the two nations is warming. The joint statement issued by the two countries last year following the visit of the then New Zealand Prime Minister, John Key, to India acknowledged that India and New Zealand, being maritime nations, have a common interest in ensuring the safety and security of sea lanes and freedom of navigation (does this ring a bell?) and in ensuring the prosperity of the Indo-Pacific region. Given this convergence of strategic interests, the two countries have agreed to strengthen and deepen bilateral political, defence and security relations. There are, of course, several other areas where the two countries are cooperating – most notably in supporting of India’s quest for a seat on the United Nations Security Council, though some further dialogue is needed in acknowledging the importance of New Delhi joining the Nuclear Suppliers’ Group. The two countries have also been negotiating a Free Trade Agreement but the issue is stuck in a limbo over high agricultural subsidies. Last year, Pranab Mukherjee became the first Indian President to visit New Zealand. And the government of India has notified the third protocol between India and New Zealand for avoidance of double taxation. That’s quite a long to-do list! But I passionately believe in fostering greater cooperation, especially between Commonwealth nations, for greater bilateral benefit and the greatest common good for the entire community of nations. This goal will take encouragement from the groundwork done for fostering closer and deeper ties between India and New Zealand. And given the thrust that Indian Prime Minister Modi is laying on his government’s Act East Policy, the future of this relationship looks bright. I very much look forward to welcoming a strong New Zealand contingent to the Go Global Expo & Conference in Mumbai in May 2018. *An amended version of this article first appeared in ‘The New Zealand India Economic Update’, December 2017.